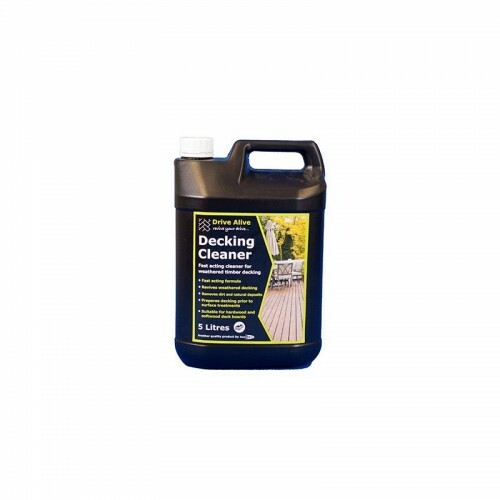 A specially formulated cleaner to revive weathered and tired hardwood and softwood timber decking. Removes dirt and natural deposits from decking, restoring the wood back to its natural appearance. Should be used prior to treating decking boards with stains and oils as it provides a good key and long lasting finish. Prepares decking prior to surface treatments. Suitable for hardwood and softwood deck boards. For best results thoroughly wash with a pressure washer. Work from one end of the decking board to the other in a continuous motion. Alternatively scrub the surface using a stiff brush then hose down. Pour directly onto the deck surface and scrub the surface immediately using a stiff brush then leave for 15-20 minutes. All cleaning residues must be completely washed away to maximise the performance of the following coatings.